Ecological Risk Assessment — Pro-vision Reef Inc. Species identified in the CITES Non-detriment Finding for the Queensland Coral Fishery were assessed in the Species Vulnerability Assessment and those that justified further consideration were assessed in the Ecological Risk Assessment. The Ecological Risk Assessment entailed a two-day workshop in May 2013. In attendance were fishery practitioners from the north, central and southern parts of the fishery; fishery managers from Queensland, Western Australia and the Northern Territory; the Great Barrier Reef Marine Park Authority; representatives from the Australian Government Environment department, including the CITES division, and the Australian Government Fisheries department; coral reef scientists; and representatives from environmental advocacy groups adjacent the Cairns and Keppel Coral Collection Areas plus a representative from WWF Australia. The analysis assigned a level of consequence (from negligible to catastrophic) and the likelihood of this consequence occurring (from remote to likely) for each species assessed. When considering the level of consequence or likelihood, participants made an assessment in context of what existing control measures and management arrangements are already in place. A ten year forecast was considered when determining consequence and likelihood levels. This time frame equates to at least one generation of growth for most coral species. The allocated risk ranking dictates the amount of justification required and also the extent of management likely to be needed to address the risk. Insignificant impacts to populations, (dynamics/structure/size). Unlikely to be measurable against background variability for this population. Possibly detectable, but minimal localised impact on population size and none on dynamics. Significant impacts on populations. Affecting recruitment levels of stocks/or their capacity to increase. Long-term local depletion if continued. Likely to cause local extinctions, if continued in longer term (i.e. probably requiring listing of species in an appropriate category of the endangered species list e.g. CITES Appendix I). The overall level of risk assigned to each species is based on the group’s assessment of the perceived consequence multiplied by the perceived likelihood. Adapted from Fletcher, W, Chesson, J, Fisher, M, Sainsbury, K, Hundloe, T, Smith, A & Whitworth, B. 2002, National ESD Reporting Framework for Australian Fisheries: The ‘How To’ Guide for Wild Capture Fisheries. FRDC Project 2000/145, Canberra, Australia. Risk profiles are used to develop appropriate mitigation measures to be implemented through the Performance Measurement System and Stewardship Action Plan 2013: Mitigating Ecological Risk in a Changing Climate. The Ecological Risk Assessment of the Queensland Coral Fishery in 2013 identified 17 species at the moderate level of risk. A further 63 species were judged to be at low risk in the fishery. The Ecological Risk Assessment of the Queensland Marine Aquarium Fish Fishery in 2008 identified two species at the moderate level of risk. A further seven species were judged to be at low risk in the fishery. The next Ecological Risk Assessment for the Queensland Marine Aquarium Fish Fishery is due in 2014. It is expected that that assessment will mirror the rigour applied to the Queensland Coral Fishery and will also demand finer scale reporting of fishery data. When the 2014 Ecological Risk Assessment is carried out, identified risks will be updated on the Pro-vision Reef Inc. website to keep the initiative current. 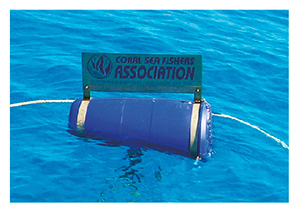 install their own moorings to minimise the risk of anchor damage. The ‘Reducing Uncertain Stock Status’ project undertaken by the Australian Bureau of Agricultural and Resource Economics and Sciences in 2011 clarified the status of stocks accessed by the aquarium sector of the Commonwealth Coral Sea Fishery. The project found the potential maximum footprint achievable by the fishery, with the two existing fishery practitioners, to be around 7.4% of the estimated suitable habitat area in a given fishing season. The estimated extraction rate for the 2008–09 fishing season (the largest catch season) for all key commercial families was less than 0.02% of potential population size. The risk assessment considered 623 species. All were found to be at low risk or very low risk. Consequently, no action will be taken in Stewardship Action Plan 2013: Mitigating Ecological Risk in a Changing Climate in regard to the Commonwealth Coral Sea Fishery assessment. This could change over time and participating businesses stand ready to respond should risks be identified in the future.